A review of David Henry Hwang’s bracing, instructive comedy “Chinglish,” staged by Annie Lareau at ArtsWest. More than 200 languages are spoken in China. And if you’re an American trying to seal a deal there, learning at least one of them can help you avoid a heap of misunderstandings. Otherwise, be sure to take an unbiased translator along to the Far East with you. The play “Chinglish” gets much of its droll humor, and sneaky drama, from the confusion that arises for a naive Cleveland sign-company owner who fails to do either. Through March 29. ArtsWest, 4711 California Ave. S.W., Seattle; $15-$34.50 (206-938-0339 or artswest.org). 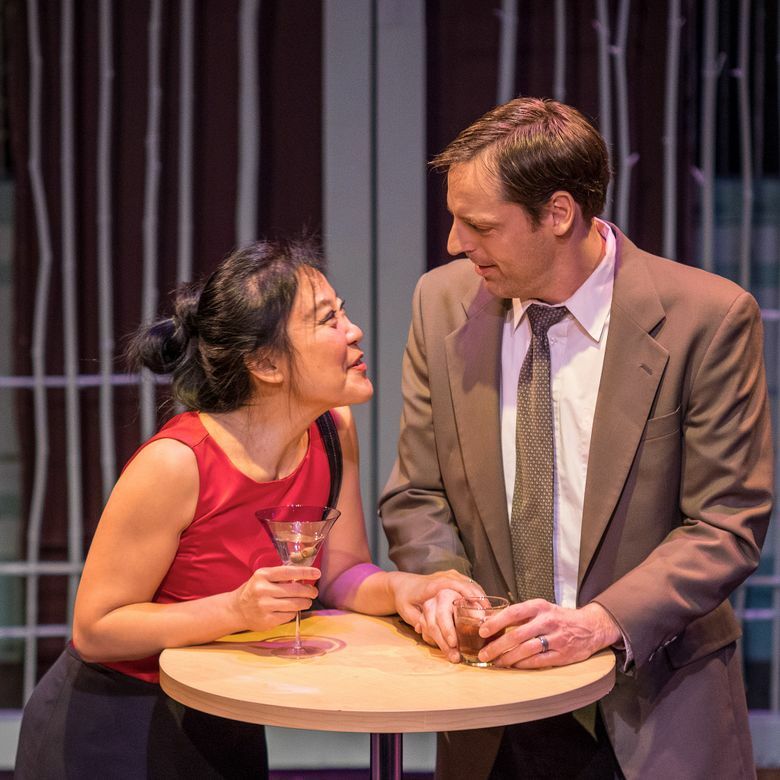 But the cross-cultural communication glitches in David Henry Hwang’s cleverly amusing and instructive tale (now in its Seattle debut at ArtsWest Playhouse) are not just linguistic. “Chinglish” reveals layers of mutual misconceptions — bureaucratic, political, sexual — as unprepared Daniel (Evan Whitfield) travels to the southwest China city of Guìyáng, desperately seeking a flush contract to provide English-language signs for a new arts center there. As Daniel recounts lessons learned to fellow Ohio entrepreneurs eager to cash in on Pacific Rim action, the play backtracks to his journey to make the pitch. Another play on signage: English translations of the Mandarin dialogue spoken by the Chinese he encounters, and by Peter (Guy Nelson), a British “consultant” hired to aid his cause, are projected on screens. The neatly devised plot: Whitfield’s wide-eyed Daniel arrives in Guìyáng aiming for a swift, direct sale. He assures the local cultural minister Cai (Hing Lam) that his products will not be rendered in the awkward, misleading “Chinglish” of signs dotting urban China. Americans may laugh at such mangled postings as “Wash After Release” (in a women’s restroom). But the Chinese find such snafus humiliating. In Daniel’s pitch meeting, there’s a marvelous verbal cacophony of misinterpreted English by Chinese translators (Audrey Fan and Serin Ngai), corrected Mandarin translations by Peter, and sardonic comments by Cai’s savvy, bilingual vice-minister Xi Yan (Kathy Hsieh). But “Chinglish” extends beyond the comedy of malapropism, thanks to the multiple, conflicting agendas Hwang surprises us with. No character is exactly what they seem — not the blandly likable Daniel, nor his Chinese counterparts. All are duplicitous, yet sympathetic. But if relationships are the essence of doing business in China, how does one build them with so little knowledge of the Other? Daniel cozies up to the flirtatious informer Xi, but can’t really read her. Even the crafty China hand Peter misjudges the quid pro quo potential from his government connections. In the microcosm of a single business deal, “Chinglish” also suggests how China’s transition from communism to state-controlled capitalism, and America’s need to comprehend and exploit the switch, affects individuals on both sides of the Pacific. Love across the cultural divide proves to be just as tricky to negotiate as commerce — and no less enticing. “Chinglish” demands bilingual skill and comic verve from the actors, and a bit more. As Daniel, Whitfield engages us with befuddled charm and anxiety. Nelson needs to loosen up onstage, but his language facility is highly impressive and useful. And as a halfhearted functionary set up for a fall, the tentative Lam is ultimately (and correctly) pitiable. Hsieh, as the multifaceted Xi, gives her best performance in memory. She swings from tough and abrupt, manipulative dealings, to sensuous, enraptured moments snatched from her circumscribed life as hard-nosed bureaucrat and loyal political wife. Questions of cultural identity when East meets West are a theme in Hwang plays, from “M. Butterfly” on. They become more timely in a global economy where old adversaries attempt to become new allies.